Most people spend their days sitting in a chair for hours on end, whether it’s for work, studying, playing computer games, or just surfing the internet. Spending so much of our lives sitting, it is incredibly important to find the proper chair to provide the necessary support and comfort. With a good quality chair, you should be able to sit for significant lengths of time in total comfort, while feeling at least some level of support. There are so many office chairs available in the market to choose from that selecting the right one from thousands can seem pretty daunting. How do you discern which option is right for you when there are innumerable chairs made to keep you comfortable in front of your home computer, endless different conference chairs to keep you and your clients happy while in a meeting, and leagues of plush executive chairs, designed for high-end support, comfort AND style. I have compiled a list of the best office chairs in several different categories that I believe everyone should consider purchasing. All of these chairs are selected from different price points, designed for a range of purposes and providing varying levels of comfort. These are the chairs you should seriously consider investing in, for both the health of you back and joints, as well as for aesthetic reasons, whether for inside your office or at home. These are our top 10 comfy office chair picks for 2014. They range in style and cost. The Lorell Executive High-Back Chair consists of a nylon, five-star base with pneumatic seat height adjustment. It has product dimensions of 31.9 x 23.8 x 14.4 inches and weighs 50 pounds. Seat height from the floor adjusts from 17” to 21”. This chair is available in the black frame color only. If you’ve been experiencing the back pain or stiffness I talked about earlier, then I believe this is a great chair for you. This executive, high-back chair features an ergonomically-designed, high back made to support the natural posture of a person’s spine. It also features a 360-degree swivel, tilt and asynchronous three-lever control. This task chair also allows full position customization; it is fully adjustable, allowing you to select the height, reclining back resistance, lumbar support, armrest height and width, forward recline angle, reclining depth, and backrest rigidity. Armchair adjustments are key for long-duration sitting to avoid shoulder and back strains. This chair has solid back support, due to its nice smooth curve, which supports the full back through the mid and upper spine. The form of this chair provides support to keep the upper spine straighter, improving posture. The seat cushion is also soft and comfortable. This high-back chair also meets the CA117 fire-retardant standard, which means it is difficult to burn, though it is not fire proof. It’s cloth fabric also saves you from occasional snack stains by being especially easy to clean. This chair is also pretty easy to assemble, as you won’t need any special tools. It comes pre-assembled, you just need to pop on the casters, attach the arms and back, then stick the seat on the base. You can score the Lorell High-Back Chair for a very lower price on Amazon, which is a serious bargain for its body-conscious design, full customization and good looks. The Boss B6888-BK is a contemporary, ergonomic chair with a mesh back for breathability and long-term comfort, even for those sitting for long hours. This chair has great lumbar support AND it’s adjustable, allowing you to customize it however you like. The Boss is a black chair with chrome accents, adjustable armrests, a 2 to 1 Sychro tilt mechanism, a seat slider that allows you to adjust the depth of the seat, and adjustable tilt tension control. If you’re reading this site, then you spend hours and hours sitting every day, so you already know that finding something comfortable, something that won’t hurt your back, shoulders, and neck is of the utmost importance. For long-duration sitters with lumbar support needs, the Boss B6888-BK is an excellent option. Many similar chairs don’t offer the seat slider, which is a great feature for those on the shorter side, allowing them better desk and keyboard accessibility. The mesh on the back of the chair and the seat will also help to keep you nice and cool, even after spending hours sitting in one place. This is a great chair to purchase if you’re looking for something like the pricey Aeron chair, but can’t justify the hefty price tag. The Boss is a similar option with a strong level of comfort and support. Assembling this chair is also a breeze, it won’t take you long, just about a half an hour or so. This chair is also great for the office as it looks professional, and stylish without costing nearly as much as other aesthetically-pleasing office chairs. You’d think that a chair with this many functions and features would cost an arm and a leg, but you can get the Boss B6888 at a lower price on Amazon, which is a huge saving from it’s standard price tag. Not only will you save more than hundreds of dollars, you also get to purchase it from the comfort of your own home. If you are into ergonomic chairs, then there is nothing better than the Aeron Chair by Herman Miller. Herman Miller-designed chairs are famous for their style and enduring commitment to comfort. With its high-tech, mesh fabric you can be sure that the Aeron not only looks better than most other mesh chairs, but it also works better than just about any other option to support your lumbar region and provide lasting comfort. The geniuses at Herman Miller have even patented the material use in the Aeron, which is specially-designed to distribute pressure evenly, keeping you cool and comfortable, no matter the environment. This chair also looks unbelievably attractive, both sophisticated and well-made. This is no surprise, given it’s huge popularity. The great people who made the Aeron also were careful to ensure that this chair will adapt to fit a person’s size, activity, posture, to a “t” all day long. It’s like having a chair custom-made just for you, designed to cater to your every need. By purchasing the Aeron, you get an amazing chair with durability, comfort, style, and best of all, a 12-year factory warranty that covers absolutely everything, including casters, tilts, pneumatic cylinders, and all the moving mechanisms. It doesn’t get much better than that. The Aeron Chair by Herman Miller is quite possibly the best chair in the market. If price isn’t a factor, everyone would buy this chair and nothing else. The mesh back is top of the line, the construction of the chair is heavy-duty, and the materials used are recycled, so you can feel good about being green. For me, the best thing about this chair is that the back will never get warm. It will stay cool and comfortable no matter how long you sit in it. You also get the added bonus of PostureFit, which supports the way your pelvis naturally tilts forward, and allows your spine to stay aligned, preventing back pain. Assembly is very easy and won’t take you hours to finish, you only need a couple of minutes and the chair will be ready for any desk adventure you want to take. You’d expect to pay thousands of dollars for something as great as the Aeron chair by Herman Miller, but you can find it for a deal on Amazon. If you’re looking for the best for style, comfort and support, and aren’t working with a restrictive budget, the Aeron chair is the one for you. The Boss Black LeatherPlus executive chair is an ergonomic office chair with great lumbar support and pneumatic seat height adjustment. Product dimensions are 28 x 26.5 x 48.5 inches and weight is 48 pounds. It comes in a black/grey color. It is designed with a waterfall seat to eliminates leg fatigue, which makes it especially comfortable to sit on for long periods of time. The Boss executive is made of high-grade leather, which makes it look elegant and high-end, but don’t be fooled, its price tag is definitely friendly to your wallet. Durability and quality both receive top marks, as all the plastic parts are made from hard structural plastics and are designed to last. The best selling point for this chair is its comfortability, due to its thoughtfully-designed lumbar support, which extends all the way up to the headrest. People who work in an office can sit in this chair for hours and still feel comfortable. It also has several inches of padding, which makes it soft and comfortable. Another notable feature is that it reclines, you just need to pull the lever that operates the air cylinder that will unlock the chair and recline up to 25 degrees, which has been shown to be the ideal for most people. The chair height is also just right for average height to tall people; unfortunately, for people who are shorter than 5’6” this chair might be a little big. Another thing to keep in mind is the non-adjustable armrests of the chair, which could cause shoulder discomfort when you are sitting for long periods of time. The LeatherPlus has a 250-pound weight capacity, so you know its construction is both firm and durable. This chair is also pretty easy to assemble; you won’t need any tools and it will only take you a few minutes. Simply unfold the chair back and the seat, which comes pre-attached to the arms, until they lock together. Next, place the air cylinder firmly into the chair base and snap the 5 wheels onto the bottom. Finally, slide the base into the seat bottom. That’s it – quick and easy with no hassle. This is a great chair for those specifically looking for leather and should definitely be on anyone’s short list. At that price point, you will certainly get your money’s worth for the chair’s comfort, durability, and high-quality. If you’re looking for a high-quality, durable, and modern high-back leather chair, then this is the perfect option for you. This is basically a high-back swivel chair, with a foam-molded back and seat and built-in lumbar support. There’s a locking tilt mechanism for a mid–pivot knee tilt. Once you take a look at this chair, you’ll understand just how stylish it looks and how chic it will look in your office. This chair is also easy to assemble and set-up won’t take much of your valuable time. Sitting on it for the first time will let you experience just how comfortable it is and how thoughtfully designed all it’s components are. This chair is available in both white and black. You can purchase this chair on Amazon, and it rates a 4.0 out of 5 stars from over 60 customer reviews. As mentioned above, there are many different kinds of office chairs – more specifically, in terms of support level and height, there are high-back office chairs, mid-back office chairs, and low-back office chairs. The high-back office chairs are the chairs that have backs extending all the way to your upper back and shoulders. These chairs are great for relieving tension from your lower back and help prevent strains. The high-back chairs are also often known as the executive chairs and are a head table and boardroom favorite. 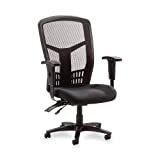 The mid-back office chairs are great for supporting the mid to upper back. These are ideal chairs for conference meetings. They provide great support and comfort, while not costing quite as much as the executive chairs. These mid-back chairs provide comfort to ease the lumbar region when sitting for long periods of time. The lumbar support on these chairs is usually designed to relieve stress, particularly from the lower back. The low-back office chairs are designed to support the lower to the middle section of your back. These chairs don’t look as fancy and are not as sophisticated as the executive chairs in terms of features and style, but they are still great chairs and worth your consideration. The low-back chairs are also more affordable than the other two options. There are quite a few considerations to take into account when you’re buying an office chair. Most notably among these are the lumbar support system, the maximum weight capacity, the build and materials used in the construction of the chair – mesh or leather – and the controls for adjustability of seat height and tilt. Lumbar support is the most important consideration when purchasing a chair, in my opinion, as it’s the one factor that can really make or break your daily experience with the chair. A great office chair should be able to keep you comfortable, even after long periods of time. You shouldn’t feel sore or stiff after a couple of hours of sitting and daily use. A great lumbar support system should work with your body alignment to prevent strain. The materials used in the construction of the chair -mesh or leather- is another important factor to consider. Mesh is always the best option, especially in hot climates, as it is the most breathable material and will provide maximum comfort. If you’re also concerned with the chair having a stylish look, then a leather chair is still a strong, semi-breathable solution. Leather can get warm and sticky if you aren’t in a cool environment, so keep this in mind when shopping. Your best office chair should be able to last you for years to come, so quality of materials, design and construction is a key consideration. Quality chairs will always require a bit more of an investment cost-wise, but you will be saving money in the long-run if you buy a well-constructed chair rather than a cheap one that will need to be replaced sooner. The adjustability of the chair should be a major factor in your chair-buying decision process. There are different levels of adjustability, so it is important to determine what is a deal breaker for you and what isn’t. All chairs will allow you to adjust seat height, most will allow tilt changes but fewer chairs offer arm-rest height customization. The height and the back tilt are the two more sought after features that people look for in a great office chair, arm rest adjustment is a little more of a luxury add-on. Maximum weight capacity isn’t as important as the overall level of support or adjustibility, but should still be taken into account as the safety of whoever will be using the chair will depend on it. Before buying the chair for you, be sure to consider all of these components, weighing the advantages of each against the cost, and using this guide to find the best option for you. These chairs aren’t just a stylistic purchase, they are a long-term investment in your health and well-being so make your choice carefully. You’re already off to a solid start just by checking out our guide!